Edmonton area of Alberta, Canada Edmonton area of Alberta, Canada U-Pick farms: Find a pick your own farm near you in Edmonton area of Alberta, Canada for fruit, vegetables, pumpkins, organic foods,local produce and more! Looking for a local, pick-your-own farm in Edmonton area of Alberta, Canada? Scroll down this page and you will see the U-Pick farms in Edmonton area of Alberta, Canada, sorted by county. Those that offer organic or sustainably grown produce are identified by the words "organic" and/or "sustainable" in Green, next to their name (see "What does Organic mean?"). The U-pick crops they offer follow the name of the farm. To search the page for a specific crop, use Ctrl-F (or on an ipad or Mac, use their "search on this page" function) If they have a website, the name will be in blue and underlined; click on it and it will open their website. If you find anything outdated or inaccurate, see the customer and farmer menus (as appropriate) at the top menu bar to submit updates and corrections and help me keep each current! If you are looking for recipes, freezing, canning, jam directions and information about saskatoons see this page. 54053 Range Road 215, Ardrossan, Alberta T8E 2B7. Phone: 780-998-2782. Fax: 780 992 9820. Email: [email protected]. Three acres of saskatoon berries. 51165 Rr 250, Edmonton, AB T9G 0B3. Phone: 780 955 3051. Email: [email protected]. Open: Monday to Sunday, from 8 am to 8 pm. Directions: : Follow the signs on 127 street sw Edmonton until you get to 41 Avenue sw, our farm is on the left side of the road (east side) just past 41 Avenue at the top of the small hill, you will see signs in the driveway - Corner Of 127 Street And 41 Avenue, South of Ellerslie Road . Click here for a map and directions. Saskatoon berries; July 15 to August 15 Evans cherries; July 31 to August 31 Apples: September to October Honey; year round. We use natural practices, but are not seeking organic certification. Saskatoons are juicy and ready now! NO chemicals of any kind have been used Varieties: Northline, Smokey, Theissen and Martin $ 10;00 for 4 Litre Ice cream pail. Payment: Cash, only. Box 2, Site 10 RR4, Edmonton, AB T5E 5S7. Phone: 780-916-0244. Email: [email protected]. Directions: Please phone for directions . We are open July, August. Our hours are: Monday to Friday, 9 am to 6 pm We sell chokecherries and fresh cut flowers. We also sell fruit packed for commercial use by processors. 215 Street And 23 Avenue, Edmonton, AB T7Y 1A9. Phone: (780) 470-0527. Fax: (780) 470-0565. Email: [email protected]. Open: Hours of operation change seasonally. Please check online Click here for current open hours, days and dates. Picking updates: Click here for picking updates. Directions: Please visit our website for a map to our farm & garden centre. Click here for a map and directions. Crops are usually available starting in July. Payment: Cash, Debit cards, Visa/MasterCard, AmEx. Black Currants. Bedding Plants, Trees & Shrubs in season. Creekside Home and Garden grows an assortment of delicious berries. Quality and timing of the berries greatly depend on the weather through the growing and fruit season, so be sure to *call ahead for crop quality and state. Click here for a link to our Facebook page. Darwell Country Gardens - U-pick Strawberries, saskatoons, and raspberries. 128 Garden Lane, Fort McMurray, AB T9H 5N4. Phone: Phone: 780-791-0212. Open: call for hours and availability. Directions: Drive south east on Buylea Ave. Road changes to Draper Road. Continue 4 km to our sign. Turn left on Garden Lane and follow to the end. We grow Fruit: Junebearing Strawberries, Raspberries, Saskatoon Berries, Pumpkin, Vegetables: Beans, Beets, Broccoli, Cabbage, Carrots, Corn, Cucumbers, Peas, Peppers, Rutabagas, Summer Squash, Tomatoes, Turnips, Winter Squash Zucchini. Specialties: Bedding Plants, Perennials, Shrubs, Trees. Produce may be available as u-pick only, pre-pick only, or some are both u-pick and pre-picked. Farm Store, Refreshments. U-Pick, no appointment necessary. Pre-picked custom orders, Farm Gate Sales. Comments from a visitor on September 28, 2010: "We love visiting this farm. It's beautiful and usually the strawberries are so plentiful to doesn't take long to fill a bucket. The staff is very laid back and makes you feel at home. We make it an annual visit and spend the day or weekend doing all kinds of things out there, and our freezer is always full of yummy produce by the end. They have tons of different vegetables to buy in their shop, as well as a few different options for U pick. The farm is set on a river with a campground and playground, it's great for day use or camping overnight. They also have some historical buildings and other activities to keep one busy." 52430 RR 265, Spruce Grove, Alberta T7X 3H2. Phone: 780-962-5824 Fax: 780-962-5824. 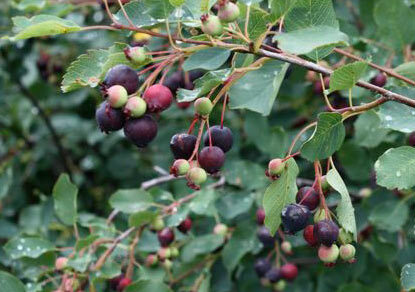 Saskatoons started in 1985 - 1993; all mature and 16 acres in full production. 11 kms west from CFRN station in Edmonton on Hwy 16A to Range Road 265 or Spruce Valley Road. Turn left (south) and go 1.5 km. South Wizard Lake Road, Almar, Alberta T0C 0V0. Phone: 780-985-3909 Fax: 780-985-3909 (phone first). Email: [email protected] Established in 1997 - 5 acres growing smoky, Northline and Theissen saskatoon berries. Directions: 13.6 km west of Hwy 2 Millet overpass on Secondary Hwy 616. 1.6 km north on Sec Hwy 795, 3 km west on South Wizard Lake Road. Click here for a map. RR # 5, Wetaskiwin, Alberta T9A 1X2. Phone: 780-352-7564 Fax: 780-352-8682. Email: [email protected] Established in 1995; have about 1,000 trees. Open noon to 8:30 pm. Directions: Exit Hwy 2 at Correctionline Overpass (6 km north of Wetaskiwin overpass or 6 km south of Millet overpass). Go west on overpass and take first north (RR 255). We are 1 km on east side of road. 19 Klm west of Millet, Alberta T0C1Z0. Phone: 780-387-5466. Fax: 780-387-7486. Email: [email protected]. Directions: Mid way between Wizzard Lake & Pigeon Lake on Hwy 795. Watch for signs. Open: Daily Mid June thru August from 9 am to 6 pm Rhubarb May-June . Saskatoons Early July -Mid Aug. Raspberries Late July--End August Vegetables Mid-June end Aug Payment: Cash, only. We have a 10 acre park like berry farm established in 2000 with over 3000 producing Northline, Thiessen and Martin Saskatoon trees as well as raspberries, rhubarb, honeyberry, black & red currant and a well cared for vegetable garden. A small on site kiosk provides refreshments, our own jams, jellies, preserves, vegetables and frozen (U Bake) pies and recipes. A full service restaurant is located one block away. Handicap access to berries is provided with golf carts and all areas are seeded to lawn. Ample on site parking and picnic tables are available for groups or individuals. Over 40 birdhouses provide nesting for swallows who provide us with a virtual mosquito free picking area. Wear hats for picking and long sleeves for picking raspberries. For further info contact Tonia or Russ by phone, fax or e mail. 56311 Lily Lake Road 25 km north of Edmonton, Alberta, Bon Accord, AB T0A 0. Phone: 780-921-2272. Email us at: [email protected]. Directions: From Edmonton, Alberta: 25 km North of Edmonton on Hwy 28 (97St.) to Bon Accord. 1 km past Bon Accord on Hwy 28, then turn left onto Lily Lake Road. 2km North on Lily Lake Road. We are open April through October. Open: 7 days a Week, 10-6. Strawberry picking days are Wednesday and Saturday, weather permitting. Festival Hours 11-5. Garden Centre Hours May - June 9-9. U-Pick Strawberries are ready July 15 - August 10. We are a host farm of the Country Soul Stroll, the third weekend of July. Come to our Fairy Berry Festival on the August Long Weekend. Haunted Pumpkin Festival - October 1 - October 30. Open for scheduled tours weekdays, and 11-5 on weekends in Oct. Payment: Cash, Visa/MasterCard, Discover, AmEx. We are an award winning farm - Alberta Farm Direct Marketer of the Year, Alberta Greenhouse Grower of the Year, and Growing Alberta Leadership Award for Community Spirit, The Fairy Berry Festival celebrates the sweetest 'fairy' strawberries of the season in Alberta with fairytales, fairies, and pirates! We also have new potatoes during strawberry season. RR # 1, DeWinton, Alberta T0L 0X0. Phone: 403-938-6245 or 1-800-463-2113 Fax: 403-938-6245. Email: [email protected] 52 acres of U-Pick saskatoons. Open year round with seasonal hours (9-5). Accept credit cards. We have a cafe on-site that offers freshly baked saskatoon pie and coffee as well as lunch items. 19 km south of Calgary on Hwy # 2; east on 338 avenue (see train display); straight east 3 km. Box 19, Site 502, RR 5, Stony Plain, Alberta T7Z 1X5. Phone: 780-963-8311. Fax: 780-963-8311. Email: [email protected] Established in 1996; 11,000 Saskatoon trees for you to pick - Smoky, Northline, Thiesson and Honeywood. Open July and August from 8:00 am to 9:00 pm; no appointment necessary. 6 km S of Stony Plain to Hw 627; 13 km W on 627 to RR 22, 1 km south. Watch for signs. Sprout Apple Farm - UPDATE for 2018: Note: We no longer do pick your own, but continue to sell fruit at the farm gate. Highway 13 and Highway 2, AB T9A0V7. Phone: 780-352-2924. Open: Monday through Saturday from 09:00 to 19:00 during the season, rom early July through late September; Call first. Directions: located on Highway 13, 1 km west of Highway 2 in central Alberta. We're 30 minutes south of Edmonton, and 50 minutes north of Red Deer; click here for a map. They grow both Day Neutral and June Bearing varieties (that means a long harvesting season). All our plants and berries are spray-free and we don't use any pesticides. Payment: accept Visa, Mastercard, and debit cards.. Comments from a visitor on July 04, 2009: "It's fine - but the strawberries are stellar! I'm sure there must be restrooms. ."